How Are You Doing on These 2018 Healthcare Trends? Gallup released their list of 2018’s biggest healthcare trends last December. 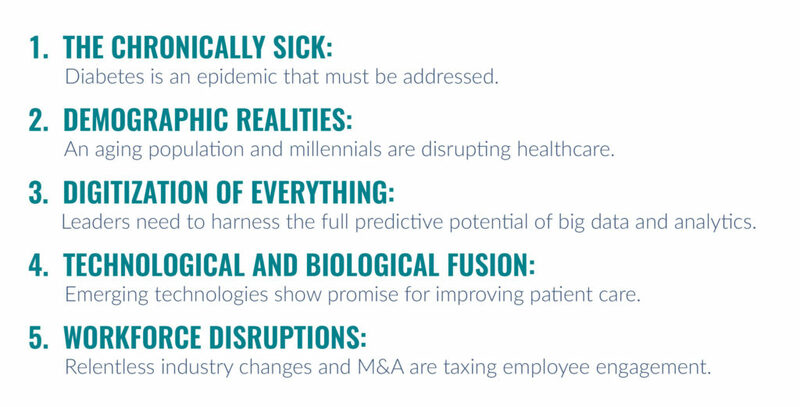 According to Gallup, these five disruptive forces also present promising opportunities for healthcare leaders to improve patient, employee and business outcomes. How are you doing in capitalizing on these opportunities? How can you be on the right side of these trends? First, if you feel overwhelmed or uneasy about today’s healthcare industry, you’re not alone. When asking U.S. adults what they believed to be the most important problem facing the country, Gallup found healthcare among their top two concerns. This should tell you a lot. Employees are as concerned as employers about the healthcare problem, which may surprise some executives. If we shifted the perspective on our employees as if they were our customers, we’d discover a key missing piece to the puzzle — and a motivation to communicate like best-in-class product marketers like Amazon, Uber or Airbnb. These capabilities are already available, and leaders need to harness the full predictive potential of big data and analytics. You no longer need to rely on your insurance company or TPA to provide you reports or insight to manage health risk. Building a data-driven culture is not only important for predicting your business outcomes, but also for the health of those you insure. It may seem like a daunting task, but thanks to innovators helping employers access their health analytics, it can now be implemented affordably, without any internal technology or data resources. Still not sure how to begin creating a data-driven culture in your company? Gallup provided some tips. Their first and most important piece of advice? Build your analytics platform today. According to Gallup, with endless quantities of healthcare data, leaders need to carefully select an analytics partner that will enable them to predict what matters for improved patient and business outcomes. Predictive Health Partners knows how to harvest and analyze it to identify the 5% of your employees that cost you nearly 50% of your healthcare spending. We can make sense of your data using our best-of-class claims analytics platform used by more than 1,500 companies to predict your source of future costs and apply prescriptive strategies in real time. It’s all about helping your employees save their money, manage their health and improve their quality of life – and your company’s bottom line. Gallup also identified the reality of changing demographics as a megatrend challenge employers are facing. America has an aging population, but millennials are disrupting the healthcare industry. The millennial generation selects and interacts with healthcare providers differently than older generations. Young people are living their entire lives on their phones according to a 2017 study, prioritizing online reviews, technological innovation, fast care, telemedicine and consumer-oriented service in their healthcare. Cost of care is also a significant factor in healthcare decision, with 21% of millennials unable to afford routine healthcare expenses. Employers cannot expect millennials to interact with their healthcare providers and use their benefits in the same way as their older coworkers. Instead, we need to update healthcare delivery models and communication tactics. If millennials prefer technology and telemedicine, employers can only truly engage them with a tool like Predictive Health’s smartphone app. We are able to deliver the consumer-oriented service this cohort craves, while also providing telemedicine, provider recommendations, all benefits information in one easy location, and numerous ways to save money on prescriptions and medical services or procedures. The next megatrend Gallup identified is the chronically sick – specifically the rising diabetes epidemic. Research has made one thing clear: diabetes in America is getting worse, not better. Diabetes costs the U.S. economy an estimated $266 billion annually, and the rates of the disease occurrence continue to rise. The disease is linked to increased workplace absenteeism and medical costs, but many diagnosed with diabetes struggle to manage their health or adhere to care standards. The key is to use proven metrics to understand and optimize patient experiences and help them build engaging, profitable, long-lasting relationships with their healthcare providers. Tackling chronic health issues in your company’s health population may start with helping a patient simply find a provider, but Predictive Health Partners can ensure care adherence through features like actionable push notifications individualized to each employee’s real-time health data. Imagine the impact harvesting this data will have on your relationship with your employees, and your employees’ relationships with their healthcare providers. If you want to successfully navigate these healthcare trends, it is vital to surround yourself with forward-thinking builders and industry leaders. Anyone can become a leader of change – you can be proactive and take advantage of the solutions to the problems that are available now. Predictive Health Partners is on the cutting edge of the healthcare industry. Not only can we can help you navigate these healthcare trends, but we can measurably impact your company’s healthcare landscape – saving you money and helping your employees live healthier lives in the process.